Social media is not about social media. It's about leadership and connections. Billions of conversations are taking place in social networks every day. But for busy executives and business owners, time constraints make it hard to dedicate time to demystifying these communication opportunities. 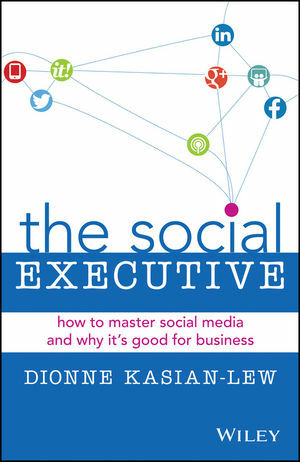 In The Social Executive, readers are given evidence-based, data-driven strategies for mastering social media, and using it to enable business success. This book's easy, straightforward, practical style ensures that you will gain a solid working platform in the shortest amount of time possible. The focus is on the reasons why social media is important for executives, and how it aligns perfectly with business strategies. The Social Executive is for analogue people who know they need to be digital but need a guiding hand - the book is a safety net - it's saying - we will guide you there - we will tell you why - we will tell you how - let us help you to remain relevant and become more influential - it's about human communication. It gives the tips and tools to adapt to new online environments, and the confidence to use them to build credibility, authority deeper and new business relationships. Written by Dionne Kasian-Lew, an expert who has advised many executives on the topic of corporate social media use, this resource also helps professionals pinpoint the most important social networks to invest time in, and explores which platforms are best suited for various communication goals. Social networks represent a powerful way to make connections and draw attention and interest to your company. This resource can help you hit the ground running and become social media savvy efficiently and effectively. DIONNE KASIAN-LEW is the CEO of The Social Executive, a specialist social media consultancy that trains boards of directors and executives on how to make the most of their online presence. A frequent author and speaker, she is rated in the top 1 per cent for global community influence by Kred.